Note that a number of the courses in these programs have also been recommended for college credit. To learn more about how and where you can earn credit for our courses see our College Credit Guide. Saylor Academy’s General Education curriculum is designed to introduce students to a broad range of subjects including written communication, computer science, mathematics, art, philosophy, social sciences, and natural sciences. While focused on introductory level subjects within these various disciplines, successful mastery of the course and program outcomes should enable students to succeed in an advanced academic setting or within the modern workplace. Students who complete this curriculum are prepared to be reflective, confident, productive citizens of their local, national, and global communities. Note: all courses may be examined in detail in our catalog. 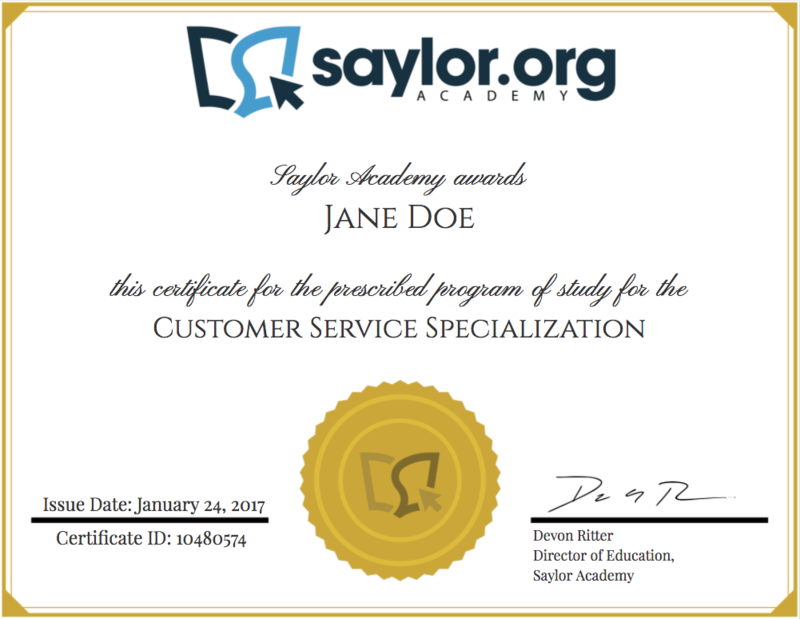 Saylor Academy’s Customer Service specialization focuses on the fundamental skills essential to effective customer service, including computer skills, business communications, and best customer service practices. Students who complete this program are prepared to operate in multiple business environments to provide service to customers, clients, and colleagues. Saylor Academy’s Business Administration curriculum is designed to prepare students for a leadership role in today’s highly competitive, global business environment. The Business Administration curriculum, which consists of a selection of courses that focus on cross-functional business competencies, provides a range of general business knowledge common to all business career paths. Students take thirteen core courses and then specialize in a functional area of business by taking six electives. The program concludes with a capstone course, in which students implement and apply the sum of information learned throughout the program in a strategic development project. Students who complete this program are prepared to succeed in leadership roles in modern, complex organizations. Saylor Academy’s Computer Science curriculum is designed to provide students with a breadth of experience in software, hardware, and mathematics, crucially complementing the many “learn to code” resources available online. Within the 20 courses required within this rigorous program, 13 are foundational to the CS discipline, three are required mathematics courses, and four courses are electives for students to gain insight into some of the more common specializations within Computer Science. Students who complete this program are prepared to work in diverse Computer Science fields.